group cancellation is 2 weeks prior to check in. In the event of a no show the reservation will be charged. One group leader will be required to give a credit card upon arrival for a Group Deposit. This needs to be the card holder. We will pre-authorize the card for 300 GBP. This list is not conclusive. Full Code of conduct will be supplied upon check-in. For Group bookings the full balance is to be paid 2 weeks prior to check in. Cvc code must be provided by email. The International Inn is an award winning hostel in the hub of Liverpool City Centre's cultural quarter located between the two Cathedrals it is within walking distance to all city centre attractions. Developed within a former Victorian warehouse the hostel is cosmopolitan and has retained tremendous character with exposed brickwork and cast iron pillars. We have accommodation for up to 100 people in both dorms and private rooms, all non-smoking. Clean bedding is provided and we have no curfew. Facilities include TV lounge/games room complete with Playstation 2 and Nintendo Wii consoles, a large flat screen TV, DVDs and a pool table. 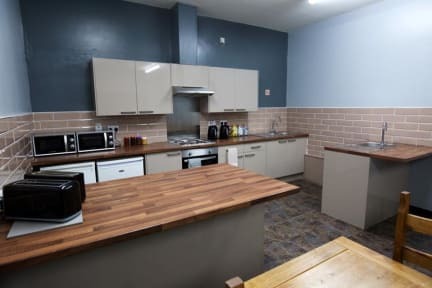 There is also a laundry room, a large fully equipped dining kitchen, baggage store, full heating, free Wi-Fi internet access, an onsite internet cafe and 24hr information desk with details of all local attractions. International Inn is also the proud owner of Liverpool's first boutique pod hotel, known as Cocoon, which is located in the Inn's basement. With Private double en suite rooms, perfect for romancing couples or folk who just want more privacy. We also have fully furnished self catering double apartments. Individual backpackers and groups are equally welcome and we have female and male only rooms plus mix rooms, available on request. Group bookings need to provide a valid credit card upon check in for the room code of conduct security bond. The International Inn has won the Mersey Tourism Awards 2002 and 2004 for Outstanding Customer Service beating off all the other hotels and hostels in Liverpool, so you can be well assured of a warm and friendly welcome when booking in here. Consistently shortlisted every year for customer service. O ponto forte deste hostel reside, sem dúvida, no seu staff, em que todos os elementos são extremamente prestáveis e simpáticos. A localização é fantástica. Como único ponto negativo, saliento o serviço de pequeno de almoço, que não existe, apesar da indicação contrária. Durante todo o dia, os residentes têm acesso a tostas com diversas compotas, o que acaba por funcionar como pequeno almoço. Ainda assim, acho que seria mais indicado se não referissem ter pequeno almoço incluído. The beds seem a bit old and they make a lot of noise when someone moves during the night, enough to wake up all the room. Overall it was okay, good value for money. 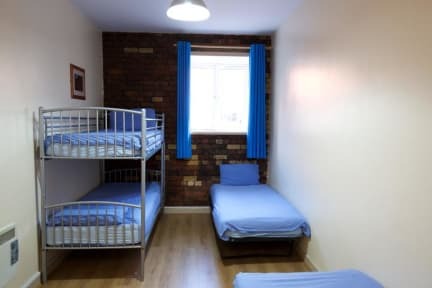 The best location you can hope for, close enough to both cathedrals, Lime St. Station and Concert St. (our go-to spot during our stay), yet hidden enough to guarantee privacy and silence. Having free tea, coffee and toasts all day long is an excellent touch. The staff was really welcoming and helpful, as was everyone we met in Liverpool. The cleaning was bad, that's the downside, I think. The dorms could use better decor, maybe a couple of chairs. Bring a towel and you'll be fine.